We’ve had some really nice feedback recently from Library patrons about how happy they are to receive SMS notification to collect their holds. They were also impressed to receive an SMS reminder to return their books, three days before they were due. Saves time and resources! Pre overdue messages look like this, holds messages tell you the title that's available to collect. 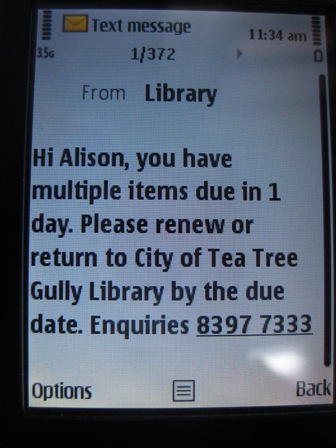 If you would like to receive SMS notification instead of snail mail or email, please ask about this at the desk next time you’re in the Library or call us on 8397 7333. This entry was posted in new resources and tagged SMS by Tea Tree Gully Library. Bookmark the permalink.